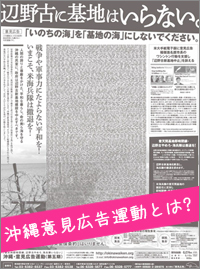 for the Okinawa Protest Advertising. We are soliciting for members and supporters, whether groups or individuals,in order to enable us to carry out the opinion advertising in American national newspapers. This page is the application form. We are also soliciting for donations for this action through postal transfer. Send a message to your representative in Congress! Send a message to your representatives in the U.S. Congress to request Unconditional immediate closure of the Futenma Marine Corps Air Station without any new construction. *Enter your name and zip code, and your message will be sent to your Congressional representative. We need your support. Please join this action. Take a stand with the Network for Okinawa! Please apply either through the online application format or fax/ postal mail, and send your donations through the postal transfer. If you use the red postal transfer format, there is no commission charge. The wallpaper download page appear after payment, and can be downloaded wallpaper from the page.